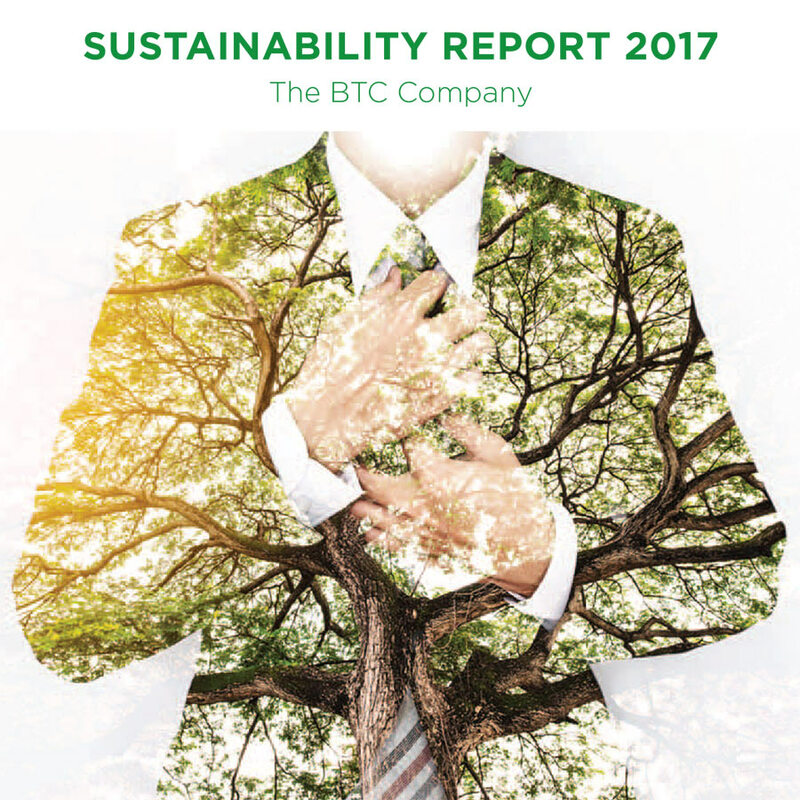 Publication of the BTC Sustainability Report 2017 • BTC d.d. The guiding principle of longterm success is: be close to people and nature. At BTC, we implement this principle through innovative sustainability projects in response to current environmental and societal challenges. We also measure our progress on a yearly basis. The adjective most fit to describe 2017 is EXCEPTIONAL. Read more about it below or dive into the pages of the Sustainability Report for 2017. May these highlights inspire you to take green steps of your own. In the scope of business unit Mission: Green, BTC carries out a number of activities categorised into seven missions: Energy Efficiency, Save Water, Waste to Resources, Green Traffic, Safety for All, Social Responsibility, and Innovation for Progress. The last mission was added this year – with the rise of breakthrough activities and projects, it rounds off our support for the development of innovative ideas and solutions. In the past 17 years, we have invested as many as 52.5 million euros in sustainable development projects. Since these activities leave important traces in the environment and the society at large, we also designed an eco-index measuring the effectiveness of the implemented projects, which first saw the light of day precisely ten years ago. We are proud to report that our eco-index scores reach higher every year: in 2017 we gathered a record-breaking 491 points. Eco-index scores are a significant reflection of the achieved environmental impacts. In 2017 we produced 1,851,177 kWh of green energy from our own renewable sources, saved 9,844,876 kWh of energy through efficient energy use projects, and relieved the environment of 5,449,637 kg of carbon dioxide. In the past five years we reached an annual water loss average of 5.9%, in 2017 we collected and sorted 67% of secondary raw materials at source, and we arranged four new one-way streets to improve the safety of our visitors and slow down traffic. We also took care of our green surfaces, planting 45 new trees and 1,500 bushes. At BTC, sustainable development projects are carried out together with our visitors, employees, business partners, and the local environment. We believe that we are stronger together, with our cooperation bringing about incredible achievements and writing many inspiring stories. In 2017 we supported more than 300 organisations, individuals, events, other activities and projects from different domains, including sports, education, science, culture, innovation, transport and ecology. In addition to our green actions, we are now also taking steps towards a transition from “green” to “smart”, since it is precisely innovation that gives us a chance to improve our competitiveness, with new solutions benefitting the society at large as well as the environment. We are fostering breakthrough innovations by building the necessary support environment and strategic partnerships ever since 2015, when we started to write the story of an innovative BTC City Ljubljana. That is when two innovation hubs opened in our midst: the ABC Accelerator and the ABC Hub. Since then, we have supported more than 90 startups and held more than 160 different events in the ABC Hub in 2017 alone. We kindly invite you to read our 2017 Sustainability Report and be inspired by the stories presented therein. Every green action is significant and priceless in the sum of all things. Together, we have the power to ensure a kind future for the people and the environment.